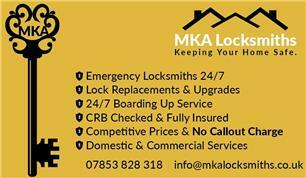 MKA Locksmiths are a Local, Reliable and Trusthworthy family run business based in Halesowen that provide Locksmith services in the West Midlands and surrounding areas. We offer a comprehensive range of Locksmith Services to Domestic and Commercial Customers at Competitive Prices. Have you been locked out? Need a new lock fitted? Or simply require a replacement better performing security lock? Whether it be for your Home or Office we supply and fit all types of locks for any types of doors, windows or garages. With a service that covers the West Midlands you can depend on MKA Locksmiths to provide you with the locksmith services you require. We carry out any Locksmith work and advice so feel free to give us a call on 07853828318 or drop us an email on [email protected] for a free no obligation quote.